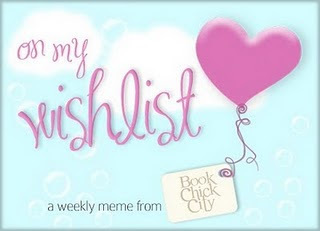 On My Wishlist is a fun weekly event hosted by Book Chick City and runs every Saturday through Friday. It's where we list all the books we want but haven't actually bought yet. They can be old, new or forthcoming. I figure it's a great way to make me go through my ever-expanding wishlist and really look at some of the things on there. I have ten new wishes list this week. Come by and see what they are. Here's what I've got on my wishlist this week. I haven't read any of those books..sorry to say hi! I hope you get them soon though! Have good weekend. I been wanting to read Delirium too Hope you get to read them soon too.